Mobile applications have certainly enhanced the value of the mobile phones and today you will find myriad of them out there in the market for customers’ use and advantages. The growing use of mobiles and mobile phone users has also led to an increase in mobile app development. Now as it comes to mobile application development, it’s necessary to consider the development of user interface as it’s the UI that is viewed and used by the users to interact with the application. There are several of platforms or frameworks that support this task of UI development for mobile apps still it is Bootstrap that enjoys utmost significance among the mobile app developers today. This mobile-first responsive front-end framework is extremely useful for the users as Bootstrap has an easy to use responsive grid that enables you to position your layout in a well-structured responsive way. The framework designed keeping the mobile use in mind responds well to various screen sizes and adapts the layout of the app easily to different screen sizes. 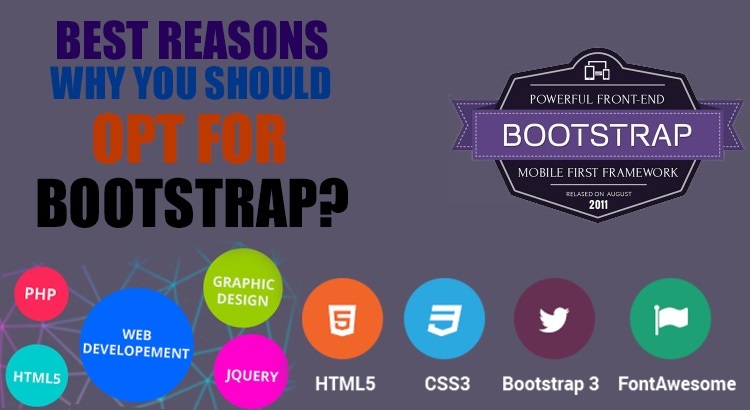 LESS stylesheets offered by Bootstrap comprises of various components that a developer can choose to use in UI development. These files are beneficial for those who regularly go for CSS preprocessing while the ones not comfortable with LESS can go for normal CSS files as bootstrap offers a set of CSS stylesheets that helps a developer in defining the basic style for all the HTML elements. Thus, it is best to give a uniform and modern look to user interface of a mobile app using Bootstrap. Stylesheets by Bootstrap can be used to style up the app interface and all that needed is to download the stylesheet files from Bootstrap website, unzip and include them in head of HTML files. Now you can access the Bootstrap framework for easy and efficient UI development. In Bootstrap, there are a 12 column, responsive grid system that automatically adjusts to the screen resolution of the device used by the user. Thus it becomes easy to develop a responsive user interface for your mobile app by implementing bootstrap in the UI development process. Bootstrap offers a number of useful components to a user interface designer like it comprises of drop down menus, navigation bar component, menus, badges, lists, progress bar and much more. These components are helpful in lessening large amount of development time as they don’t require to be developed from scratch with Bootstrap. You just simply have to include the right classes of the components as required.